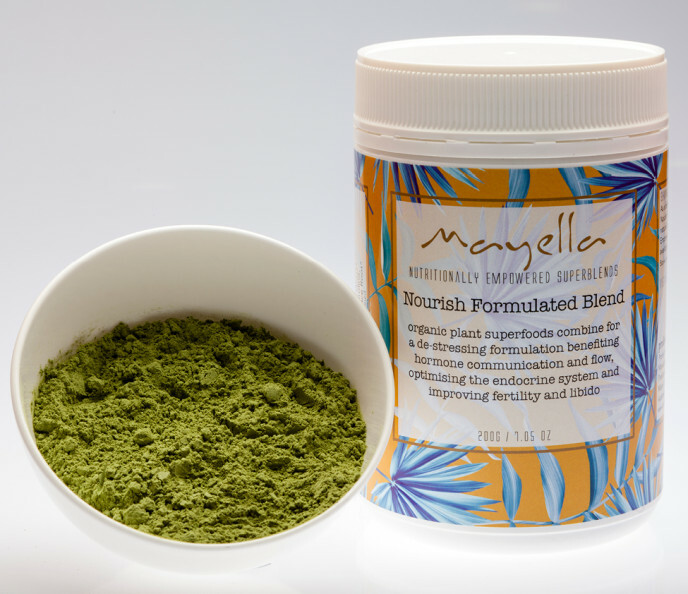 Specially formulated for optimal nutrition with organic superfoods, Mayella ® Nourish Formulated Blend is a natural whole food daily nutritional source that is highly recommended for all women, men, teens and children. 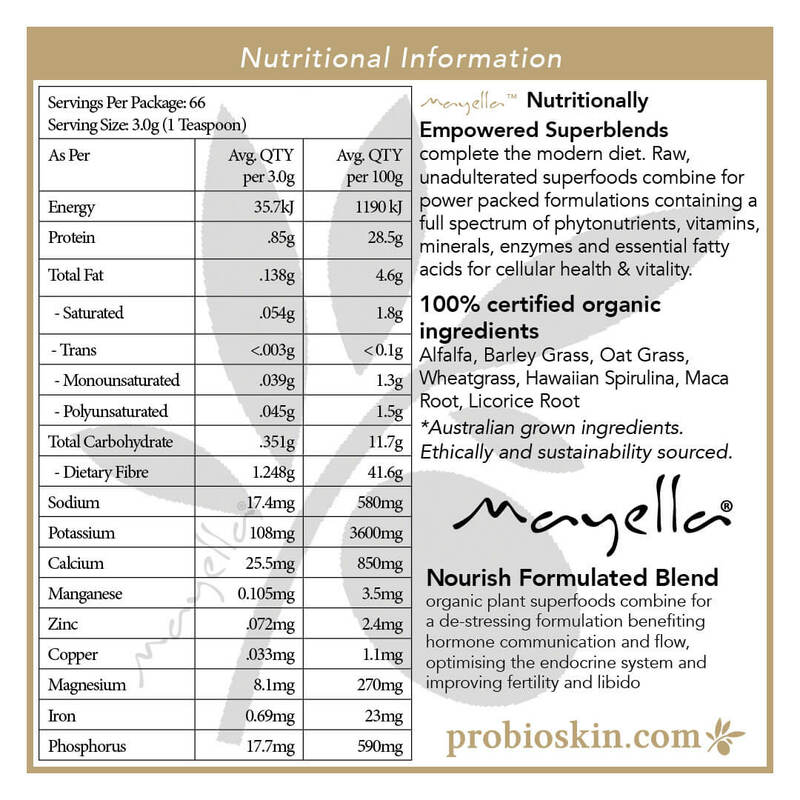 Mayella ® Nourish Formulated Blend provides a rich profile of phytonutrients, alkaloids, essential fatty acids and much needed enzymes. A clean easily digested vegan source of protein, plentiful vitamins and minerals that work as a powerful team for harmonious body function. Our system benefits with the improved hormone communication and flow, optimising our all important endocrine system to improve libido and fertility. The ideal ratio of vegan protein, healthy fats and carbohydrates are easy to absorb and digest. Daily cleansing, detoxifying, energising and alkalising are all essential body functions supporting a long healthy life. We believe our organic Probioskin ® green superfoods with our Probio skincare go hand in hand with you for optimal health, the vitality to live life to its fullest. Embracing the beautiful person you know you are – inside and out! Pro meaning for, Bio meaning life. A daily dose of green is the perfect recipe to achieving the optimal health and vitality you want. Mayella ® Nourish Formulated Blend is rich in alkalising greens with a full spectrum of vitamins and minerals to facilitate circulating oxygen levels giving more energy, efficient cellular activity and regeneration. Alkalising your body detoxes your system and balances free radical damage. Nourish has naturally high levels of Chlorophyll, known for it cleansing and detoxing effects on our blood and internal systems, tissue repair and regeneration and as an anti-inflammatory and digestive aid. Maca and Licorice facilitate balance in our hormone function. As adaptogens, these herbs support lifting when we are depleted and calming when we are in stress flight mode! Regenerating our reserve tanks by taking back control of our on / off switch. Adaptogens normalise the levels of stress hormone cortisol, supporting our busy little adrenal glands and helping to normalise function and helping to avoid burnout, fatigue and depletion of energy levels. In a time where life is busy and the daily intake of stimulants are abundant eg caffeine, nicotine, sugar, the herbs found in our plantbased alkalising formulation help to reduce stress and improve energy levels, build stamina and the immune system. 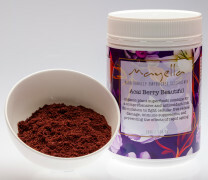 Our Mayella® Nourish formula is perfect for total wellness, recovery from illness, stress and general fatigue. Nourish gives energy and the ingredients to support our everyday nutritional needs. Assisting with digestion, fertility, weight loss, detoxification, hormone balance and support, energy levels, prevention and recovery from illness. Working from the inside out to help with skin conditions such as psoriasis, dermatitis, eczema and conditions such as lupus, chronic fatigue,heat flushes, arthritis and asthma, ulcers,haemorrhoids, allergies and infections of the urinary tract and respiratory system, constipation, anxiety and depression. As a daily nutritional source, mix 1 – 2 teaspoons of Mayella ® Nourish Formulated Blend into a tall glass of filtered water, natural coconut water or your favourite fruit/vegetable juice. Alternatively, our nourishing super blend can be added to your favourite smoothie or protein shake as an additional nutritional boost and clean protein source. Store in a cool dry place, below 30°C / 86°F. Empowered smoothies and other nourishing recipe ideas are available on our blog or free to download e-books. Certified organic superfoods combine for nutritionally empowered superblends ethically sourced and formulated with love in Australia. Australian Alfalfa* – Alfalfa’s deep roots grow almost 40 metres into the earth, absorbing rare trace minerals and making it one of nature’s richest sources of bio-available nutrients. Highly alkaline benefiting intestinal absorption and beneficially balancing body pH levels. High in chlorophyll and particularly rich in calcium, magnesium, phosphorus, potassium and vitamins A, B-group, C, D, E, K and biotin. Fibre dense aiding in digestion, supporting weight loss and reducing appetite. Australian Barley Grass* – The young green shoots of barley grass are nutrient powerhouses and are capable of high element absorption from the soil in which they are grown before they form into barley grain. High in chlorophyll to detoxify toxic build up in the intestines and a rich nutrient profile of potassium, calcium, magnesium, iron, copper, phosphorus, manganese, zinc, beta carotene, B1, B2, B6, C, folic acid, and pantothenic acid. Barley grass has one of the highest natural levels of enzyme SOD (superoxide dismutase), which is a powerful antioxidant that protects the cells against toxic free radicals, thought to be a primary culprit in ageing. Australian Oat Grass* – The young green shoots of oat grass are antioxidant and blood cleansing super stars when harvested before forming into oat grain. 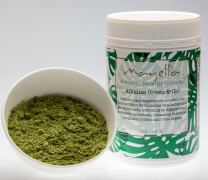 High in chlorophyll to maintain healthy blood counts and a rich profile of many essential vitamins and minerals. Oat grass is extremely rich in antioxidants, including polyphenols and one powerful antioxidant called tricin, a flavone compound that exerts smooth muscle relaxing properties with a stimulating action that nourishes and strengthens the nervous system. Green oats are also high in beta-glucan, which helps stimulate immune functions. Australian Wheat Grass* – The young green shoots of wheat grass are harvested at their nutritional peak prior to maturing into wheat grain and before any “gluten” is formed. 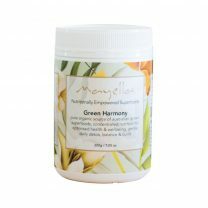 High in chlorophyll, stimulating tissue growth and repair with over 90 minerals vital for life. Selenium contained in wheat grass is a powerful trace mineral and important in maintaining a resistance to disease, it is also known for increasing antibody production to strengthen the body’s ability to fight abnormal cell growth. High in iron assisting the body to transport and store oxygen in the blood and muscles, produce energy, maintain the immune system and is essential for fatty acid metabolism assisting the human body to detoxify and cleanse. Hawaiian Spirulina – Containing a unique array of 94 trace elements, our Hawaiian grown spirulina is the most nutrient rich globally available. High in and a great vegan source of natural iron, B-12, calcium, bet carotene, zeaxanthin and vitamin A. Hawaiian Spirulina has a rich antioxidant and phytonutrient profile, is a highly digestible clean protein containing every amino acid and performs as an anti-inflammatory and sustainable energy source. Peruvian Maca Root – Grown in the mountains of Peru, Maca has been called “Peruvian ginseng” and is an ancient supplement and food ingredient. Rich in vitamins B-group, C, and E, providing plenty of calcium, zinc, iron, magnesium, phosphorous and amino acids. Maca root balances hormones by optimising communication and flow, thus benefiting menstrual cycles, menopause, mood, stress, mental clarity and optimising sexual function improving fertility and libido. Provides a high amount of iron, restoring and oxygenating red blood cells for energy production, stamina, aiding anaemia and cardiovascular disease. Supports healthy skin by clearing hormonal acne and blemishes while decreasing skin sensitivity to extreme temperatures, cold and hot weather. Liquorice Root – Traditionally used in herbal medicine as vital to hormonal regulation. Liquorice root works as an anti-inflammatory via the body’s own corticosteroid mechanisms, is anti-ulcer against gastrointestinal ulcers, anti-viral, anti-fungal and anti-bacterial. An adaptogen tonic increasing the resistance to the effects of physical, mental and emotional stress and a hepatoprotective herb offering protective actions to the liver. *Australian grown ingredients. All other ingredients are sourced from the global village and are of the highest available quality while ethically and sustainably supporting local independent farmers under fair trade practices.